If there is no immediate threat, like a wildfire or a bear breathing down your neck, then stop and sit down. The goal is to prevent any irrational thinking due to fear or an adrenaline dump. Sitting down lowers your resting heart rate and just relaxes you. That’s right big boy, go ahead and take a seat.. Comfortable? Good. Now the hormonal cocktail of adrenaline that may or may not get dumped in your bloodstream due to anxiety and fear needs to be addressed. Elevated heart rate, increased respiration, muscle tremors, nausea, sweating are some of the body’s reaction to having adrenaline and other hormones dumped into your bloodstream. Narrowed vision, auditory exclusion, memory loss, loss of bladder or sphincter control could follow if you don’t reign in the process and be interpreted as “fear”. Don’t sweat it, realize that you just got a shot of “Super-fuel” that is preparing your body for super-human feats. You are stronger, faster, and more resistant to pain, but you may not need that “go” juice right now, so let’s just relax a bit. Cops, soldiers, and firefighters are all taught to manage the effect of adrenaline by using “tactical” breathing. Inhale deeply for three seconds, hold for three seconds, and exhale for three seconds. Keep that up for a few cycles and you will start calming down. Now that we have the Hulk contained, let’s break out the best survival tool we have, our brain. Here are a few tips to help you cultivate that winning mindset. 1. Focus on a reason that gives you strength. It may be your family, it may be spiritual, or it may come from some ornery, never-say-die spirit deep inside you. Keep that image or emotion locked in your mind and tap into it whenever your reserves start to run low. 2. If a situation or task seems daunting, break it down into small, attainable goals and take them one step at a time. Physically demanding workouts are a great way to develop and build up the mental toughness gas tank if you ever need it. 3. Realize that your brain is an unbelievable problem solver. Your ability to adapt, improvise, and overcome, may be dampened in our modern world, but turn that dog loose and let it go to work. You are a powerful, creative being, so it is time break out of any boxes and rely on yourself to help you now. 4. Understand the difference between real threats and fears. The time to work on conquering fears is not during an emergency, but now, at home or in training. Research your fears and the real threats until you have a thorough understanding of both. Hypothermia, trauma, and dehydration will kill you, darkness and most creepy crawlies will not. 5. Physically fit people are generally more resistant and harder to kill. Stories abound of fitness being a factor in overcoming life or death situations. Do your homework and get in shape now. 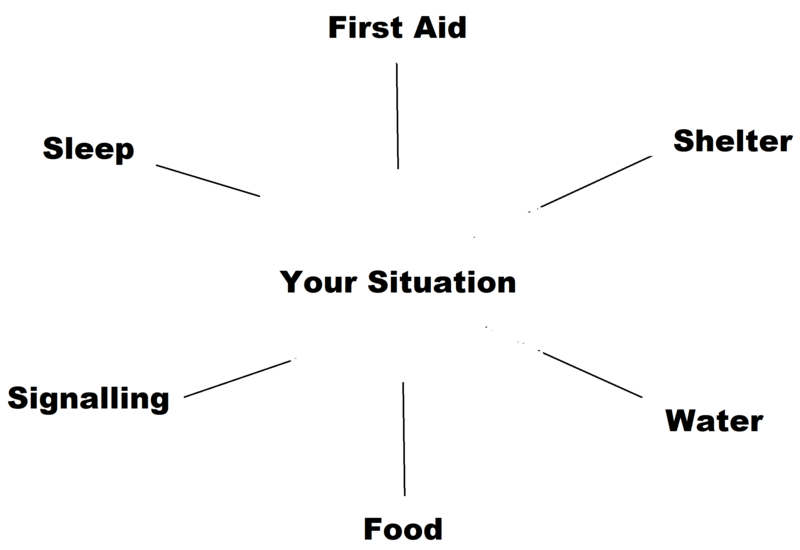 If you find yourself in a physically demanding scenario and you are not up to par, just refer to Tip #2 and break the task down into small chunks with adequate rest. 6. Time to program the computer with your Positive Mental Attitude!! It is one thing to think positive thoughts, but speaking or even writing it gives you even more power. “I will do whatever it takes to survive” or “I will not give up” are good mantras. Repeat them over and over, out loud until you believe it and feel it with every fiber of your being. Visualize the intended outcome of your ordeal. Picture yourself safe, happy, and surrounded by your family. Use those thoughts to bolster your will to survive. If negative thoughts try to creep into your head, do not let them stay. Vanquish them with positive affirmations, your mantra, and your fanatical will to live. When you are done with the mental pep talk, it is time to shift your thoughts to the survival priorities. A long standing rule in the survival community is the Rule of Three’s. While there are always exceptions to the rules, the important factor to consider is that the priorities are going to be dependent on your situation. If you are bleeding, stop it. If you have cell service, make signalling your priority. If you are slightly dehydrated, move that up the scale. The Rule of Threes are a good guideline to help you prioritize, but should not be inscribed in stone. Take a look at your surroundings and identify threats. Are there widow makers? How much time until it gets dark? Do you hear vehicles in the distance? Can you smell a campfire? Are there tinder sources available? How about fuel? Where was the last water source? What kind of trees are those? Use all your senses to observe and interpret your surroundings. Once that is done, pull out your gear and inventory everything. Numerous times I have been surprised by extra batteries or a piece of fatwood floating around in the bottom of my pack. Maybe that lint in your pocket is what you need to start your fire. Maybe there is a mirror in your first aid kit that you forgot about. Having a fresh idea of your supplies will help you in the next stage. After thinking about your priorities and observing your surroundings and gear, it is time to make some choices. Like prioritizing, planning is dependent on your situation. Generally, staying put and waiting for rescue is a good plan, but what if you didn’t tell anyone you were headed out and no one will know you are missing for days? Maybe splinting that ankle, making a crutch, and sucking it up for the hike out is a better plan. Hard and fast rules may not apply to your circumstances, so make the best plan for what you are dealing with. Recognize that fatigue and dehydration reduce the ability to think clearly and factor that into the decision making process. STOP has been a long used acronym in the survival community. I first read about adding the “A” in Cody Lundin’s excellent book 98.6 Degrees, and I converted. Not because I am a fan of the Swedish word, but because I have lived in a world of planning without action. We all do it, make plans, get ready, and then something fizzles out. I am guilty of it as well, but now is not the time to lose motivation. The best plan in the world will not do you any good until it is put in to action. Once you have a plan, start using your skills and execute the plan. If it needs to be changed because of new variables or obstacles, then start the planning process over. If you are with others and agreed upon a plan, make sure the changes are discussed and everyone is on board.